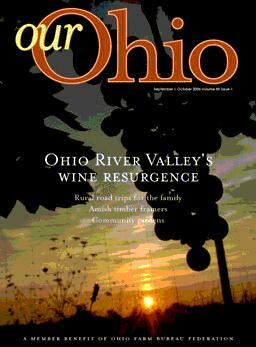 Harmony Hill featured in Our Ohio magazine, "Ohio River Valley's Wine Resurgence". 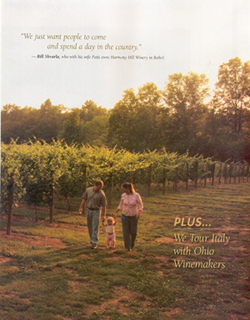 Harmony Hill featured on the cover of Ohio Magazine, August 2005. Wine, ironically enough, is putting Bethel on the map. Harmony Hill Vineyard and Winery has been hidden in Bethel for four years. 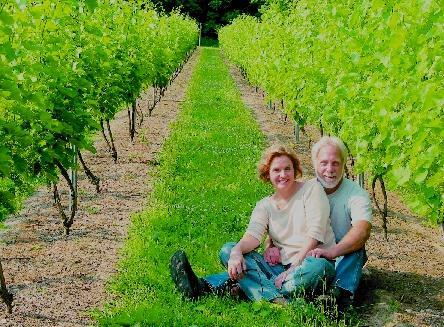 This July, however, owner's Bill and Patti Skvarla, will be opening their land, winery and, of course, bottles to the public. In 2001 Harmony Hill farm was a place where the Skvarlas lived with their animals and a small medicinal herb farm. "This was a place where the dogs never chased the cats. Dogs never chased the ducks. The donkeys and horses got along and everyone lived in harmony. That's how we got the name," Patti said. Concern over national government putting a hand in alternative medicine caused the Skvarlas to diversify their farm, Bill said. "We started looking at what we wanted to be doing when we retired," Bill said. 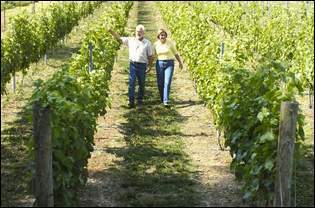 In 2001, after a year of research, the pair planted 1,200 Kendall-Jackson cabernet wine grapes. As amateurs they started entering their wine into contests and while they knew they had a good product, they were surprised when right from the start they were winning. In 2003, the winery was bonded and they began producing wine on a larger scale. Large scale, of course, being relatively small since they are the only two doing the work. Realizing their winery would never be able to significantly compete with large wineries because of the production capabilities, the pair decided to go a different way with their products. 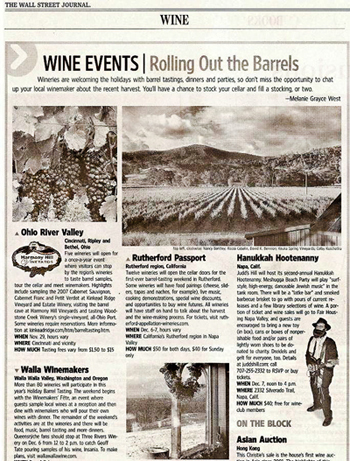 "When you think of California wines, they are most likely good, probably predictable and certainly boring," Bill said. The Skvarlas chose to mix things up, blending a variety of grapes into new creations and varieties of wine. "They definitely don't taste like anything you have tasted before," Bill said. The Skvarlas will have the grand opening 12 p.m. to 6 p.m., Saturday, July 2, and Monday, July 4, at Harmony Hill, 2534 Swings Corner Point Isabel Road. 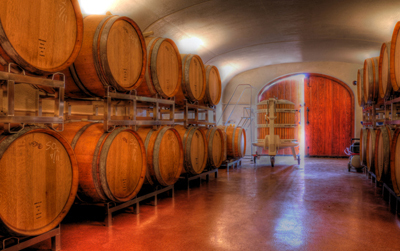 Guests will be invited to take a self-guided tour of the vineyard and the winery. The tour starts from receiving the grafted root, through planting pruning and collecting the grapes. Then through crushing, fermenting, squeezing, fermenting again, filtering, barreling and bottling. Of course no stop to a winery would be complete without a tasting. "People do need to bring their own picnic, but what this is really about is spending a nice day in the country," Bill said. For more information on the opening go to www.HHwines.com or call 734-3548. Southern Ohio's newest winery is breaking all the rules, in a good way. When I received the lead on the Harmony Hill winery opening to the public, taking it was a no brainer. This story was mine. In my family, wine is something that brings us together. It gives us an excuse to sit with each other, shares stories and enjoy our family. Yet, inevitably, there comes a point when my sister will point and laugh at me, the sole white wine drinker at the table. To her a certain sophistication comes with her ability to put down the driest, strongest red wine. Somehow, she even manages to do it with a smile on her face. Even if it isn't family, most people have experienced the terribly uncomfortable feeling of the restaurant wine tasting. The waiter presents the bottle, hands you the cork and then pours what looks like a child size portion into your glass. What do you do? Smell it, sip it, spit it or just get up and leave. When the pretension seems like too much step away from the restaurant, take off the fancy clothes and head out to the county. 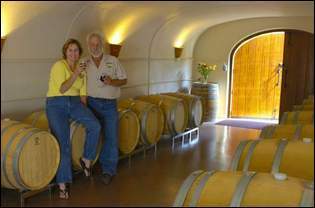 Bill and Patti Skvarla, the owners and entire workforce of the Harmony Hill vineyard and winery, are about as laid-back as they come. The Skvarla's share their land with their dogs, cats, miniature donkeys and of course three acres of vineyards. Using their knowledge and a whole lot of chemistry, they blend grapes never put together before, creating combinations that are unlike any other wine. Their new combinations go hand in hand with their new way of thinking about wine. Gone are the days of red wine with steak and white wine with fish, these wines are mix and match. "There are no rules. If you want to drink white wine with your steak, then drink white wine. If you want to have red wine with popcorn, who cares," said Bill. This was nice to hear considering I am one of those who drinks white wine with steak. The wine that you like most is the wine that goes best with your food, according to this duo. "We drink it with what we have. If we are having Skyline for dinner, then we have wine with our Skyline,"
Patti said. Winning award after award in wine competitions and selling out at wine festivals is a sure fire sign it's time to let the locals in on this wine. The Skvarla's will be opening their doors to the public for the first time this fourth of July weekend. This is a place where you're sure to find a wine to go with your favorite meal, whether it's filet mignon or a Big Mac.